HOPE HIGH, Class of 84′ to debut at Long Wharf Theatre! 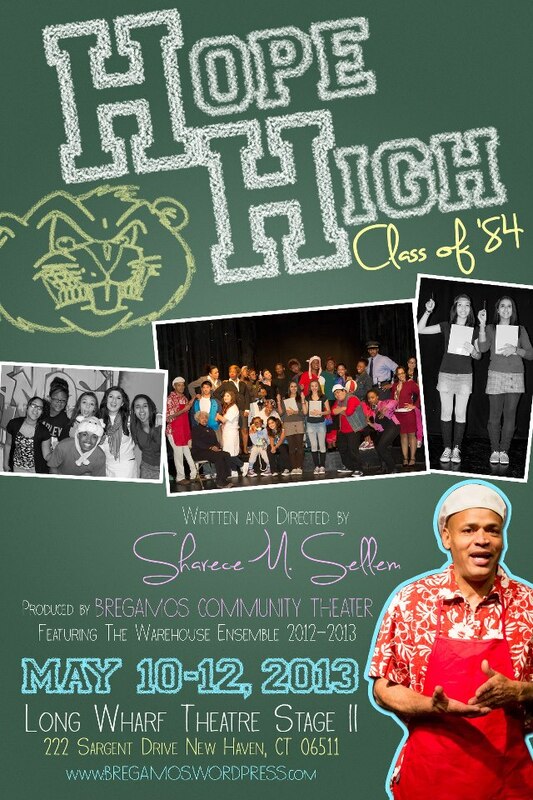 Hope High: Class of ’84 will have three shows taking place on Long Wharf Theatre’s Stage II; Friday, May 10 and Saturday, May 11, 2013 at 7:00pm and a matinee on Sunday, May 12, 2013 at 2:00pm. This work is a stage play production written and directed by New Haven playwright, Sharece M. Sellem. It will be the first production put on by Bregamos Community Theater’s new Warehouse Ensemble; New Haven’s only youth theater program for teens ages 12-19. Sharece M. Sellem is a writer, choreographer and actor. Her most recent projects include being a choreographer in the 2012 production of The Wiz at the Charter Oak Cultural Center in Hartford and her work as Artistic Director of Writer’s Block Ink Community Arts Center in New London, CT. She was a featured guest on the Colin McEnroe show in March 2013 to discuss her work blending the art of mime with dance. Established in 2002, Bregamos Community Theater has brought over 15 plays and many workshops to the Greater New Haven area with the mission of providing a space where community members from all walks of life, all ages and all backgrounds can participate in different facets of the theater. In 2008, they made their European debut at the International Community Arts Festival in Rotterdam, Netherlands. (203) 303-7300. For more information on The Warehouse Ensemble, Hope High: Class of ’84, or to schedule an interview with Sharece M. Sellem, please call Tianna Glass at (860) 916-4095 or email her at warehousebct@gmail.com.